The Best Photojournalism blogs from thousands of top Photojournalism blogs in our index using search and social metrics. Data will be refreshed once a week. 2.31 Disphotic | Exploring photography and it's intersections with journalism, art, and history. 2.34 News Photographers Association of Canada | Celebrating Quality Photography in Journalism. Photojournalism newsletter is a comprehensive summary of the day's most important blog posts and news articles from the best Photojournalism websites on the web, and delivered to your email inbox each morning. To subscribe, simply provide us with your email address. Boston, MA/worldwide About Blog The Big Picture is a photo blog created by the photo editors of @BostonGlobe, with the best in photojournalism from around the world. Facebook fans 159,527. Twitter followers 327,280. Washington, D.C. About Blog A photojournalism blog. The Atlantic's Photo section is an expanded home for photography at TheAtlantic.com. Facebook fans 2,205,362. Twitter followers 1,580,515. About Blog Reading the Pictures analyzes and reports news and media images. In an ever more visual society, we seek to better understand the levels of meaning, the underlying story lines and the various agendas reflected in the more prominent news pictures of the day. We also publish and provide a careful look at original photojournalism and concerned photography. Facebook fans 9,608. Twitter followers 11,394. TV. Radio. Online About Blog The latest stories from the In Pictures section of the BBC News web site. Facebook fans 43,628,658. Twitter followers 1,012,611. London About Blog British Journal of Photography is the world's longest running photography magazine, established in 1854. Find the latest photography news and features. Facebook fans 552,035. Twitter followers 243,030. Netherlands About Blog NOOR is a collective uniting a select group of highly accomplished photojournalists and documentary storytellers focusing on contemporary global issues. Facebook fans 69,566. Twitter followers 49,273. San Francisco, CA About Blog Stories by and about photojournalists, the photography industry, and discussions of photojournalistic practices. Facebook fans 1,140,204. Twitter followers 502,264. United Kingdom About Blog The British Press Photographers' Association provides its members with a voice to raise awareness and appreciation of our industry. The membership is drawn from every part of the country, and represents the broadest selection of newspaper, magazine and agency photographers. Facebook fans 1,799. Twitter followers 3,522. About Blog Photojournalism Now is a blog focused on photojournalism and social documentary photography. Facebook fans 4,351. Twitter followers 188. Washington, DC About Blog Rodney Bailey is among the finest wedding photographers in Washington DC with a pure passion for the art of photojournalism. Rodney Bailey produces rich photos and portraits for any type of outdoor photography. Facebook fans 5,245. Twitter followers 6,181. Sydney About Blog Shotkit showcases the photos of the world's leading professional and amateur photographers, revealing their tools of the trade. Take a peek inside the camera bags of your favourite photographers, to learn what photographic equipment they use to capture their iconic images. Check out the best photojournalism on Shotkit including what camera gear photojournalists carry in their camera bags. New York, NY About Blog A professional photography blog by the editors of Photo District News. PDN magazine delivers unbiased news and analysis, interviews, photography portfolios, and information photographers need to survive in a competitive business. Facebook fans 116,313. Twitter followers 359,194. Bangladesh About Blog GMB Akash is a well known street photographer who has received many awards and his blog depicts the experiences of the voiceless that are expressed through his photography. Facebook fans 503,897. Twitter followers 1,618. About Blog Nikon Ambassador and National Geographic magazine photographer Ami Vitale has traveled to more than 90 countries, bearing witness not only to violence and conflict, but also to surreal beauty and the enduring power of the human spirit. She is also on the Photojournalism Advisory Council for the Alexia Foundation. Facebook fans 7,935. Twitter followers 12,316. Columbia, SC About Blog Columbia SC photographer specializing in photojournalism, commercial and portrait photography with a commitment to local narratives in the state of South Carolina. Facebook fans 2,632. Twitter followers 1,268. Canada About Blog Established in 1976, Photo Life is Canada’s leading source for photography. Including technical knowledge and tips, industry news and events, international travel photography and documentaries, as well as innovative approaches, techniques and secrets of the trade. Facebook fans n/a. Twitter followers 1,345. Mountain View, CA About Blog Comprehensive up-to-date news coverage on photojournalism, aggregated from sources all over the world by Google News. Facebook fans 23,743,264. Twitter followers 213,606. Los Angeles, SoCal worldwide About Blog The Los Angeles Times is the largest metropolitan daily newspaper in the country, with a daily readership of 1.4 million and 2.4 million on Sunday, more than 39 million unique latimes.com visitors monthly and a combined print and online local weekly audience of 4.3 million. Facebook fans 230,932. Twitter followers 605,006. Global About Blog Getty Images is the most trusted and esteemed source of visual content in the world, with over 200 million assets available through its industry-leading sites www.gettyimages.com and www.istock.com. Facebook fans n/a. Twitter followers 975,201. Portland, OR About Blog Prison Photography is all about the image, incarnation, representation, media, social justice and responsible photography. Prison Photography also concerns itself with civil liberties and ethics as they relate to photography and photojournalism. Facebook fans n/a. Twitter followers 31,083. Worldwide About Blog Daily news source for everyone who has an interest in photography. Our mission is to connect you to the information that matters. Facebook fans n/a. Twitter followers 16,656. About Blog Johnny Joo a 26-year-old photojournalist from Ohio. Capturing the wild and unseen, as well as the forgotten places of our world. Facebook fans 26,097. Twitter followers 1,020. About Blog Grobl specializes in humanitarian photojournalism, documenting relief efforts and development work of NGOs worldwide. Facebook fans 1,447. Twitter followers 644. Loughborough University, UK About Blog A Photojournalism Blog by Marco Bohr. Facebook fans 5,780. Twitter followers 7,321. Gaza Stip, Occupied Palestinia About Blog A Photojournalism and War Photography Blog and includes Documentary Images of Conflict, Crisis and Disaster From Around The World. Facebook fans 2,053. Twitter followers 1,489. China About Blog A photojournalism blog. Sean Gallagher is a National Geographic Creative photographer and film maker, specialising in covering environmental issues in Asia for over a decade. Facebook fans 1,003. Twitter followers 4,352. Washington, DCish About Blog A Photojournalism blog best in real wedding photojournalism. .
31. Disphotic | Exploring photography and it's intersections with journalism, art, and history. London, UK. About Blog Disphotic was written between 2013 and 2016 by Lewis Bush, a photographer, writer/researcher, occasional curator, and lecturer in photojournalism and documentary photography at London College of Communication, University of the Arts London. Facebook fans 2,324. Twitter followers 4,429. Maplewood, NJ About Blog This blog is part of a project borne during my travels as a professional photojournalist. In the last few years this blog has morphed into a daily journal of my experiences around the world. Facebook fans n/a. Twitter followers 13,884. Hong Kong About Blog Photojournalism Links is a website dedicated to sharing all things good and interesting in photojournalism, documentary photography, and beyond. Facebook fans 20,791. Twitter followers 81,819. 34. News Photographers Association of Canada | Celebrating Quality Photography in Journalism. Canada About Blog NPAC celebrates and champions quality and ethical photography in journalism. Through a variety of efforts, the association challenges its members to better themselves and to continually raise the bar of industry standards. Facebook fans 747. Twitter followers 1,525. Atlanta, GA About Blog The Decisive Moment is a team of seasoned photojournalists and curators who work together to deliver an exceptional experience. Our passion has always been documenting the REAL moments and genuine emotions of your wedding day. Our featured images and portfolio of work focus on actual events and real moments from celebrations we have been honored to document. Facebook fans 1,020. Twitter followers 455. Washington, DC metro area About Blog Official Blog of the Women Photojournalists of Washington. Bringing together professional women working in the field of visual journalism around the Washington D.C. area as colleagues and friends. We meet regularly to discuss issues in photojournalism, share work and ideas and build camaraderie. Facebook fans 2,588. Twitter followers 917. Athens, Ga. About Blog I am on the faculty of the Henry W. Grady College of Journalism and Mass Communication at the University of Georgia teaching photojournalism and multimedia journalism courses. The entries here will touch upon that dilemma – that of a former photojournalist, a visual storyteller, who now trains others to do the same. Facebook fans n/a. Twitter followers 1,496. Gabriola Island, BC About Blog I’m passionate about the marine environment, having grown up on Vancouver Island and being a boater since a very young age.Many of my photos are shot from our boat or my kayak, exploring BC’s amazing and intricate coastline. New York, U.S.A About Blog We are a press photo agency, carrying a working relationship with professional photographers around the world. We are dedicated to reportage, following in the traditions of the great photo agencies of the 20th century, and with respect to the magazines that carried their work, including Life and many others. Our selection of photography is made up of photo essays, spot news, and stock photography. Facebook fans 66. Twitter followers 209. Bellingham, WA About Blog Paul Conrad is an award-winning, nationally and internationally published freelance photographer. His specialty is photojournalism covering news, sports, and editorial portraits, he also is skilled in family portraiture, high school senior portraits, and weddings. Facebook fans 991. Twitter followers 1,500. Facebook fans 5,505. Twitter followers 559. Houston About Blog A Photojournalism Blog and the aim of the blog is saving the world with photography one image at a time. Facebook fans 251. Twitter followers 542. Rhode Island, USA About Blog At Sara Zarrella Photography we are Photo Novelists telling a story in every picture. A photo novelist is a fusion of techniques practiced in photojournalism along with fashion photography to create a story through your images. Facebook fans 2,159. Twitter followers 124. About Blog Hi, I'm Brooke! I'm a Grand Rapids, MI photographer specializing in birth photography and family photojournalism. I like to teach other women how to use their DSLRs to photograph their families, too. I believe in the power of beauty and the beauty of the raw and ordinary. Sna Diego, CA About Blog Wedding Photographers located in San Diego CA. Specializing in fine art, documentary wedding photography and wedding photojournalism. Our photojournalistic style is natural, authentic and artistic. As Award Winning photographers, we were voted one of the Top 3 wedding photographers in San Diego. Facebook fans 969. Twitter followers 25. Buffalo, NY About Blog Using the power of photojournalism to expose social and ecological injustice. Facebook fans 225. Twitter followers 358. About Blog Sharing a curated selection of the best photojournalism . Focused on armed conflicts, the environment, inequality and migration issues. Facebook fans 180. Twitter followers 15,214. Llangollen, Wales About Blog Photojournalist based in north #Wales, working worldwide. Find News and Vignettes. NY City, New England About Blog The blog is all about exclusive Wedding Photojournalism & Contemporary Portraits. Facebook fans 1,345. Twitter followers n/a. About Blog JimColton.com is a full service photography editing and consulting site. We offer everything from freelance photo editing to lectures and presentations to portfolio reviews. New England About Blog Boston wedding and editorial photographer, Jackie Ricciardi, serves Worcester, Boston, Massachusetts & beyond. Specializing in weddings & photojournalism. Facebook fans 752. Twitter followers 220. Fort Worth, TX About Blog The conference for those who believe photojournalism is a calling and the act of bearing witness is essential. Our desire is to encourage visual storytellers to produce the best visual images and stories possible. Facebook fans 177. Twitter followers 406. About Blog Photojournalism at Western Kentucky University. About - British Journal of Photography is the world's longest running photography magazine, established in 1854. Find the latest photography news and features. About - Shutter 16 Magazine is the collaboration of many enthusiastic and dedicated music journalists with a passion for the lens or written word. About - Disphotic was written between 2013 and 2016 by Lewis Bush, a photographer, writer/researcher, occasional curator, and lecturer in photojournalism and documentary photography at London College of Communication, University of the Arts London. About - The British Press Photographers' Association provides its members with a voice to raise awareness and appreciation of our industry. The membership is drawn from every part of the country, and represents the broadest selection of newspaper, magazine and agency photographers. 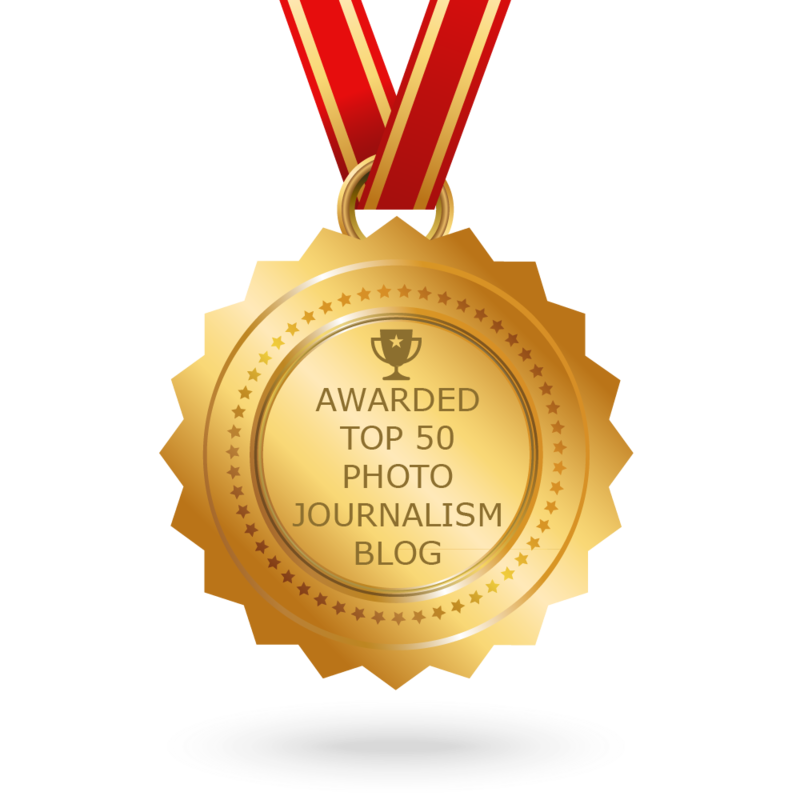 CONGRATULATIONS to every blogger that has made this Top Photojournalism Blogs list! This is the most comprehensive list of best Photojournalism blogs on the internet and I’m honoured to have you as part of this! I personally give you a high-five and want to thank you for your contribution to this world.